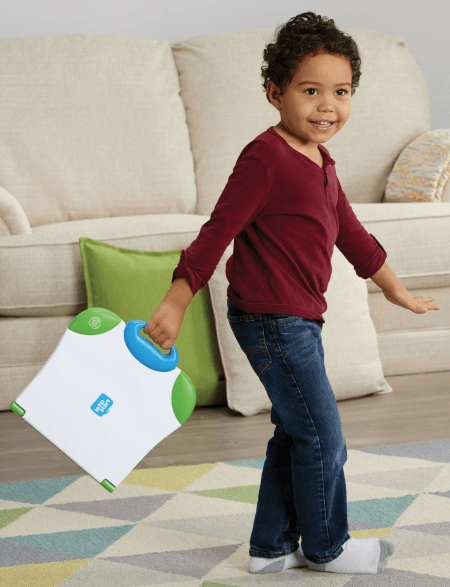 LeapStart™ is an interactive learning system that gets kids excited about counting, learning to read, problem solving and more through fun, replayable activities. The magic behind LeapStart™ is a stylus that reads invisible dots on every page, triggering questions, challenges, songs, jokes and more. 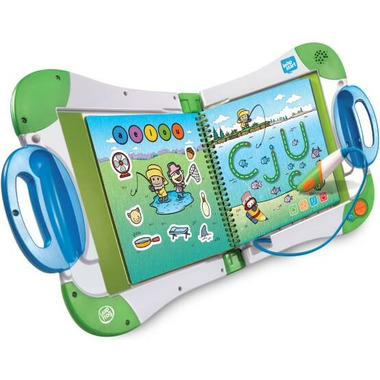 The grow-with-me stylus is comfortable for kids of all ages and promotes proper writing grip. 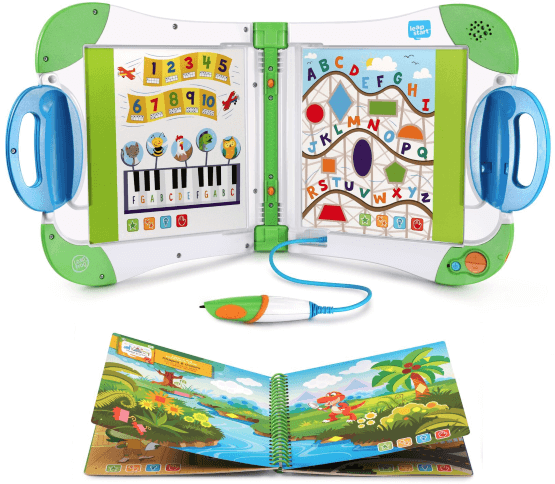 The LeapStart™ library features touch-and-talk games, creative challenges, problem-solving puzzles, math mazes and more for 2-7 year olds with more than 30 activities in every book. Most replayable activities have two levels with more than 50 key skills per level so kids can play and learn at the right level and move up when they’re ready. 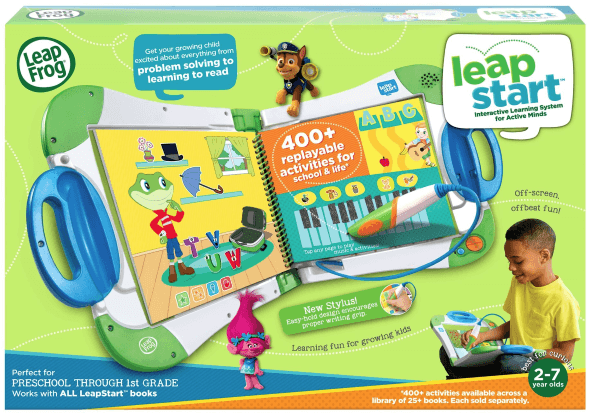 The LeapStart™ library of 25+ books (sold separately) covers a variety of preschool through first grade subjects and includes two Learn to Read book sets. A total of 400+ activities help kids build tomorrow’s skills today. 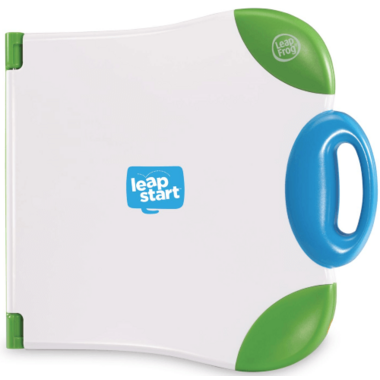 The magic behind LeapStart™ is a stylus that reads invisible dots on every page, triggering questions, challenges, songs, jokes and more. Includes 400+ activities across a library of more than 25 books (sold separately), which includes two Learn to Read book sets to help kids build tomorrow’s skills today. This is a fun interactive game for my kiddo. As she is just two she's a little young for it but I can't wait for her to grow into loving this learning toy. Its easy for her to carry around with the handles. I wish they had a French version. Bought this for my 19mos old. Although he still needs some help using it due to age he loves it. Loves to read and I think he'll be able to use it completely on his own in no time. 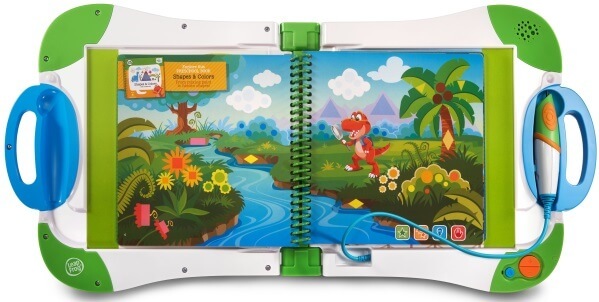 I was looking for.something more interactive as my little.one loves to read / story time. Thus definitely fits the bill. I read a lot of reviews on this before purchasing for my sons 3rd birthday. I was skeptical of whether or not it would be one of the toys that he plays with once. This wasn't the case! We bought 2 of the books that go along with it. We sit down after dinner and play with it together and he LOVES it. I can already see that it is going to help teach him letter recognition. Each book has many pages and it takes time to play on each one so the books will last. They are worth their high price. Ex: We play for about 30 minutes each night and only make it through about 4 pages until he has lost interest so we stop. But that 30 mins is quality time spent LEARNING! I can see that we will be able to go through each book many times. 4 Star rating is only because I wish the cord on the stylus was a bit longer and less chunky I also am nervous that it will stop working properly before we have outgrown it because toddlers like to yank on the stylus/cord that's attached.